This week’s NFL player draft and Sunday’s Monster Energy NASCAR Cup Series race at Talladega (Ala.) Superspeedway are special events for Shannon Myers, the rear tire changer for Stewart-Haas Racing’s No. 14 Haas Automation Demo Day Ford Fusion driven by Clint Bowyer. The Miami Dolphins drafted Myers in the seventh round of the 1995 draft. 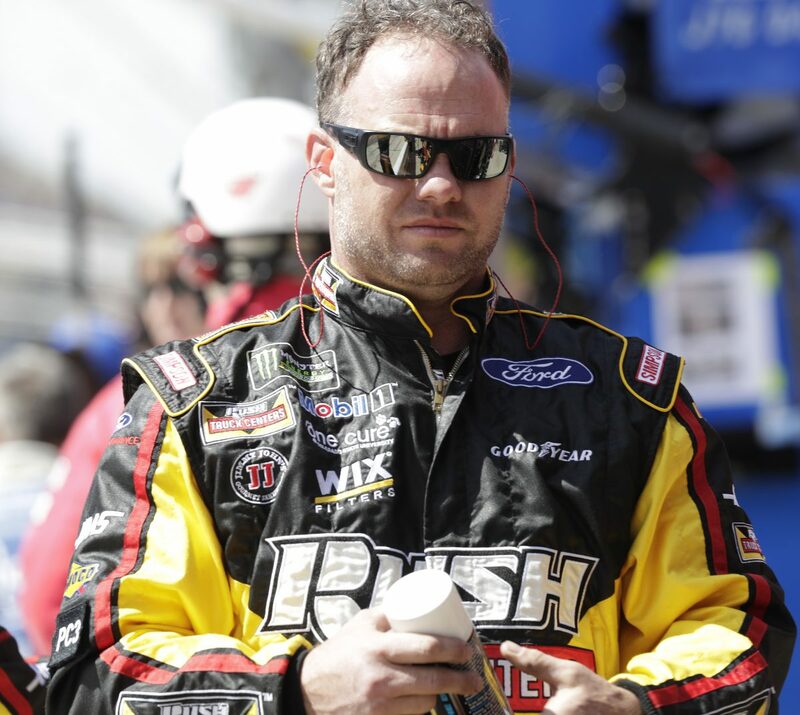 After a professional football career hampered by injury, the speedy wide receiver out of NCAA Division II Lenoir-Rhyne University in Hickory, North Carolina joined the NASCAR circuit in 2001 as a tire changer. Sunday afternoon, he’ll change tires for Bowyer as the veteran driver seeks his second win of the season and his third career NASCAR Cup Series win at Talladega. The soft spoken Myers knows the importance this week holds for college football players and their families. Myers played American Legion baseball the day he was drafted, but after the game joined the well-wishers at his mother’s North Carolina home. With shot nerves from answering plenty of “false-alarm” calls from friends, Myers waited by the telephone and television. Myers walked back inside the house and gave everyone the thumbs up, cueing smiles and tears of joy. Within minutes, he gave interviews with the Miami media. Myers learned the plays and caught passes thrown by quarterback Dan Marino. He even spent Thanksgiving at the Hall of Fame quarterback’s house. His tenure with the Dolphins ended with a kidney injury during minicamp, but perseverance led to stints in Oakland, Tampa, Seattle and the New York Jets, along with teams in Canada and Europe. His travels enabled him to learn from some of the sport’s Super Bowl-winning coaches like Shula, Jimmy Johnson, Jon Gruden, Mike Holmgren, Bill Parcells and Tony Dungy. He brought lessons from those coaches to NASCAR after following a doctor’s suggestion to enter a pit crew developmental program at Petty Enterprises. He progressed through the NASCAR world changing tires on Dale Earnhardt Jr.’s 2004 Daytona 500-winning pit crew and won two Xfinity Series titles with Martin Truex Jr. He also worked at Michael Waltrip Racing and Wood Brothers Racing in recent years. Myers feels the similarities between football and NASCAR are many. Myers said he expects more professional athletes to join over-the-wall NASCAR pit crews. A few tenths of a second saved in the pits can be the difference between winning and losing races. Myers and his Stewart-Haas Racing (SHR) team know the risks and rewards of restrictor-plate racing at Talladega and its sister track Daytona (Fla.) International Speedway, where the difference between victory and defeat is quite small. Bowyer plans to drive his No. 14 Haas Automation Demo Day Ford into the SHR history book this weekend. Talladega and Kentucky Speedway in Sparta are the only two active tracks where SHR has yet to win. History says Bowyer could change that Sunday. In addition to two victories at Talladega, he’s posted six top-five finishes and 12 top-10s. He’s been part of a dominant four-driver SHR contingent that has won four of the season’s first nine races. Bowyer is third in points and coming off a ninth-place finish at Richmond (Va.) Raceway, where his No. 14 Ford led 45 laps. He has six top-10 finishes in the season’s nine races, including four consecutive top-10s. Those results include Bowyer’s first win at SHR and ninth career victory March 26 at Martinsville (Va.) Speedway. Bowyer thinks a victory party at Talladega would surpass one at just about any other track. Is it difficult to hold back at Talladega? How important is qualifying at Talladega?